Veterinary News » Will potassium iodide prevent radiation poisoning in pets? Concerns over pending nuclear fallout in Japan have caused a spike in sales of potassium iodine tablets, not only in Japan, but also one the western coast of USA and Canada. Some health food stores are completely sold out of potassium iodide as many pet owners are administering them to their outdoor cats and dogs to help protect them if a cloud of nuclear radiation travels over the ocean. 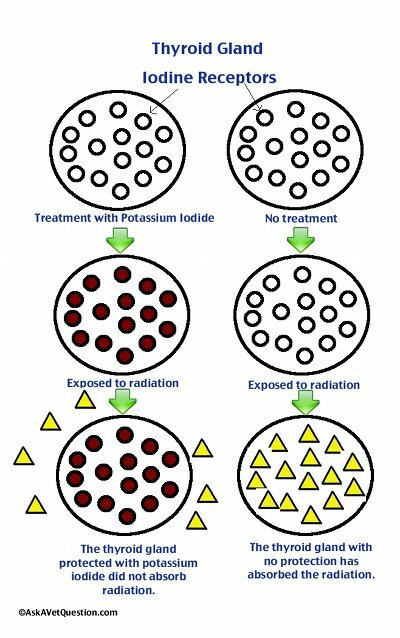 How does potassium iodine prevent radiation poisoning? Well really, it doesn’t. You’ll see at the end of my article why I don’t believe any animals should be getting potassium iodide. However, I’ll try to explain here why people are buying up iodine like crazy. Is it dangerous to give potassium iodide to pets? With that being said, the risk of overdose is small. What is the dose of potassium iodide to give to a dog or cat? Dogs: 1.4 mg/kg once a day. This is the same as 100mg for a 70lb (32 kg) dog. Cats: 20 mg/kg once to twice daily. Take note of the potential side effects as described above. Use at your own risk! Again, this is not likely to be too helpful. If there is any benefit, the medication must be given at least 4 hours before exposure to radiation. Kelp tablets may be another source of potassium iodide as well. Does Beta-Glucan prevent against radiation? I just had a comment added to the blog that said that beta glucan is a great protection against radiation exposure. This is not true, but I can understand where the confusion comes from. Beta-Glucan is sometimes given to people after they have had radiation therapy for cancer. The drug is not meant to protect people from radiation. Rather, it is meant to help the immune system fight against the effects of the radiation. When people have radiation therapy for cancer they will often have damage to their bone marrow. This can result in decreased numbers of red and white blood cells. The Beta-Glucan is a supplement which is believed to help boost the immune system create more red and white blood cells once the radiation treatment is stopped. Beta-Glucan will not protect against nuclear accident radiation. I’d love to hear your comments on this article. Feel free to drop a line below! Transdermal drugs for pets may no longer be FDA approved. Vetsulin shortage predicted by FDA. Birds exposed to Chernobyl radiation have smaller brains. 8 Responses to "Will potassium iodide prevent radiation poisoning in pets?" If Potasium Iodide only helps the thyroid (If it helps) What do you suggest will help the rest of our bodies (Both Human and Animals) from Cesium, plutonium, uranium, iridium and radium poisoning? Good question Elizabeth. I don’t believe that there is anything you can take orally to fight against radiation exposure. I’m definitely not an expert in nuclear fallout! So I’m probably not the best person to answer your question. However, as I understand it, even if radiation does make its way across the ocean, it is extremely unlikely to reach levels that would be harmful to us or our pets. That isn’t true. There is plenty you can do to detoxify your body after exposure. You just need to do research to find out what works best for you. Blue green algae like Chlorella and Spirulina works well to detox. Baking Soda taken orally is also good. Kelp, magnesium baths, natural clay supplements. Numerous natural detoxification techniques out there. You just have to be willing to investigate and find credible sources. Are any of these specific treatments for radiation exposure? While I’m sure there are many natural substances that detox certain areas of our body, I’m skeptical that these will do anything to help with radiation exposure. However, if you have any scientific research articles that support your theory, I’d love to read them! Beta glucan has been proven effective in protecting the body from the effects of radiation exposure. There is was a study done by the U.S. military. Beta glucan protects the entire body, not just the thyroid gland. The highest-quality beta glucan I have personally found, and the only one with the patented beta glucan that is best absorbed and used by the body is from NSC-24. Thank you for your comment! Beta Glucan actually does not protect against radiation…I’ve added some information to the bottom of my article to explain why. There are several logical steps that reasonable people and pet owners can take. First, don’t buy into the general sense of hysteria that the media have created. Second, get informed. If you have the time, there is a lot of good information available. I’m so tired of reading “clippets” and hearing “sound-bites” about the dangers of radiation and conversely about the dangers of taking Potassium Iodide or giving it to pets. If you want information about the best courses of action, ignore the “post Japan Crisis” articles, and read up what was written by the EPA, FEMA. etc, prior to the current flood of half truths. – To date, levels of radiation from Japan reported in Hawaii, Alaska, and on the West Coast of the USA are still well below any danger levels for people or pets. Might this change? Possibly it will, if things go dramatically downhill on the ground in Japan. Prudence demands that we pay attention and only act if and when things deteriorate further. – Should I be taking Potassium Iodide or giving it to my pets as a precautionary measure at this time? Absolutely NOT! All the guidelines tell you that only when public safety officials and/or the press report that there is an imminent danger of exposure to unsafe levels of radiation, should you take or administer Potassium Iodide for yourself, or to your family and pets. – Is Potassium Iodide safe for people and pets? If taken or administered in the recommended dose, Potassium Iodide is perfectly safe, except for people or pets with certain very rare conditions. 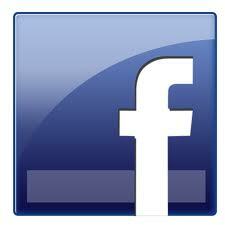 In fact, it is recommended by FEMA and many other agencies in the event of a nuclear event. How do you know?? Again, it isn’t rocket science that you should call your doctor or veterinarian and ask if it’s safe for you or your pet to take Potassium Iodide in the case of a dangerous radioactive event. The last report I read indicated that Potassium Iodide was generally safe for pets, as long as they didn’t get an overdose. Why would you overdose your pet?? Can’t a little common sense prevail? We aren’t children. – Should you rush out and buy a stockpile of Potassium Iodide? Again, there’s no real hurry. FEMA recommends that you have Potassium Iodide in you emergency preparedness Kit in the appropriate amount to cover your family and pets. Since the most beneficial protection of Potassium Iodide is provide when you take or administer it PRIOR to radioactive exposure, you might want to have it on hand as FEMA recommends. If you wait until the last moment to buy some, you may not be able to get any. Your call…. I suggest that it is better to be safe than sorry. Since Potassium Iodide(KI) is inexpensive and has a long shelf life, why not have it on hand, just in case …..especially if you live in Hawaii, Alaska, the West coast, or within 50 miles of a nuclear plant?? 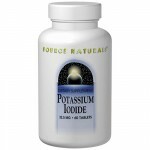 You can buy IOSAT, an FDA approved Potassium Iodide pills for human consumption at http://www.nukepills.com. A Potassium Iodide preparation that is formulated specifically for pets is PETSHIELD-KI available at http://WWW.KI4PETS.COM . Read all the detailed information in their FAQs and call you Doctor and/or Vet with specific questions where needed. Let a little common sense intrude on the discussion. You’ll be glad you did.